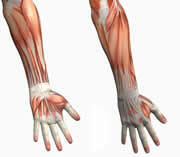 The fuction of the forearms is for wrist extension, abduction, adduction and finger extension/abduction. Training the forearms is usually one of the easier muscle groups to train because when you use dumbbells your forearms are always working against gravity to hold onto the weights. If you plan on training forearms on their own day, pick a lower body day.Carpal Tunnel Syndome is associated with forearms and please take a break from forearm training if you feel pain or any irritation in your forearms.